A.M. Repeat of last week more or less, except I ran 13 miles total and did 2x400 towards the end of the run. The 3 mile tempo went like this: 5:37 - 5:44 - 5:44 - total 17:05.8. Last quarter was 84. Pretty much an identical repeat of last week except it was 3 seconds per mile faster. I'll take those 3 seconds. It also felt more manageable, even though I still slowed down after the first mile. The legs still were feeling weak in the last mile. The problem likely was low glycogen from the long run on Saturday. I ran with the kids - Benjamin did 3, Jenny and Julia 2, Joseph 1, and Jacob 0.5. In the last 1.5 I did 2x400 - 75.2 (rolling), 74.5 (down). I could really tell in those quarter that the legs were fatiguing fast and were in slow motion. A quick quarter surprisingly is a great test of fuel levels. Even though you theoretically have plenty of glycogen to run a fast quarter at almost any time, when the levels dip below a critical threshold there is some negative feedback mechanism that reduces the muscle activity to protect the supplies. So if we know the runner well enough we can check the muscle glycogen quite reliably without muscle biopsy by just running a quick quarter. If anybody has doubts about that, try this - warm up, do a few strides, and run a quick quarter. Then go out at the pace you optimistically hope to be able to finish the marathon in. After about 90 minutes it will become unsustainable. As soon as that happens, run a quarter all out and be done. Compare the times of the quarters. The second one will probably be about 10 seconds slower than the first. Now, rest a week, and try the same pace, except run your all out quarter after 45 minutes. It will probably be only 5 seconds slower than the first. You will see that the quarter speed very much correlates with the fuel levels. A.M. 8 miles early before going to the temple. Jenny and Julia did 2, Joseph 1, and Jacob 0.5. Benjamin waited to run with me in the afternoon. P.M. Total of 5.2, 3.2 of it with Benjamin. Did 2x400 - 75.7 up and 70.8 down. Benjamin was about 0.5 s back in the first one, but stayed with me and got a new 400 PR on the second one. The purpose of those 400s for me was to test the glycogen levels. Looks like some rest and frequent snacking on dates helped. Unlike yesterday, I felt strong in the second half of those quarters even at the very end of the day. b) In the past I have been able to correct the symptoms of low fuel shutdown by doing a few fast quarters a couple of times a week. c) There was a study a few years ago that demonstrated that a 3 minute bout of maximum effort greatly enhances the ability of the body to absorb glycogen over the next 24-28 hours. I do not remember all of the science behind it, but I believe the basic idea is that if you squeeze the toothpaste tube very hard for a brief moment the vacuum creates a momentum for the new toothpaste to come in if a source is available. From this I intuitively conclude that a couple of quick quarters at the end of any run will stimulate glycogen absorption and teach the nervous system to work with less fear in a low fuel situation. A good marathoner must learn how not to panic when low fuel signals are being received, and it must happen on both the conscious and subconscious levels. After having run 50+ marathons I am OK on the conscious level, but the subconscious is much harder to train. So anyway, the theory aside, I did this; 74.5 up - 71.1 down - 74.4 up - 70.8 down - 72.3 rolling and 69.7 down. Total run was 12.2 mile. Benjamin did 3.2, Jenny and Julia 2, Joseph 1, and Jacob 0.5. Joseph asked me during the family scripture study what "endure to the end" meant. I explained the idea using examples from running. He has been remembering it during his runs. A.M. 12 miles as usual. Benjamin did 3, Jenny and Julia 2, Joseph 1, and Jacob 0.5. Did 2x400 towards the end. 72.2 rolling and 70.4 rolling down. Both had minor headwind. I felt strong. A.M. Did my 5 mile tempo on the Fast Running Blog course after a 2 mile warmup. It started well, but deteriorated after two miles. The splits were 5:36 - 5:40 - 5:49 - 5:48 - 5:51 - total time 28:44, 8 seconds faster than last week, in spite of the positive split. I felt strong in the first 2 miles, but then the legs were tired and had no zip. HR refused to rise above 160, and preferred 156 with a slower pace as a consequence. So I finished the tempo, jogged home, (11 miles at that point), ate some dates and waited for them to assimilate while I did some computer work. Then I ran with the kids. 2 with Jenny and Julia, 1 with Joseph, 0.5 with Jacob, and 3 with Benjamin. In the last 1.5 I did 2x400 - 73.4 rolling and 70.9 down. Benjamin kept up with me on both. Due to the fatigue earlier I cut the long run to 17.5 total to be on the safe side and also as an experiment to see how I would feel on Tuesday. I have always thought that cardio weakness would only manifest itself by HR going through the roof, but something is making me wonder if it could also manifest itself by HR refusing to go above a certain threshold. After all, tired legs do that - your leg turnover goes down along with your stride length when you are tired. So I went to Good Earth and got some hawthorn berry pills just in case as well. Much needed day of rest. Went to church as usual. The lesson in Sunday school was on the life of Christ. We watched the video of the Quorum of the Twelve Apostles testifying of Christ. All twelve, plus the First Presidency. All testified of the divinity of Christ, and His Atonement. I find the argument that the Latter-Day Saints are not Christian an odd one. There are arguments against the LDS faith that I can understand and appreciate, but this is not one of them. Calling a church non-Christian implies that you have been given the authority to define what is Christian and what is not. Most of the critics as far as I know could not reasonably claim such authority or try to explain how they got it. I am aware of the "authority of the Bible" argument, and it does not hold water. We read the Bible just as much as anybody else, so even if the Bible did give one authority to judge, we would have it as much as anybody else. I suppose the Catholic church could have some form of a claim for this authority, but what is ironic is that most of the criticism does not come from the Catholic church. But if it did, in order to maintain some form of logic, I would expect them to state that every church that is not Catholic is equally not Christian because they lack the inspired understanding of Christ or authority to act in His name. What we really get the flack for is being different from the established Christian tradition. While being different does not always imply being right (although some people think that all they need to do to be right is be different), if you are right, you will often be different. When you have found the truth, it will differ from error. When the error has been well established and perpetuated through centuries of tradition, the truth will be in conflict with it, and will undoubtedly raise some eyebrows. So what? Stick with the truth regardless. A.M. 12.5 total , 6.5 of it with the kids. Benjamin did 3, Jenny and Julia 2, Joseph 1, and Jacob 0.5. Did 2x400 towards the end - 74.3 rolling and 70.1 rolling down. The pace on kids runs is actually quite decent - Benjamin averages around 7:40, Jenny and Julia around 8:45. Joseph and Jacob are about 9:00 - 9:30. A.M. Total of 13. 3 mile tempo after a 2 mile warmup. Got 16:57.9 with the splits of 5:36 - 5:42 - 5:39. This marks poking my head out of the zone of desperation - not being able to crack 17:00 in a 3 mile tempo. Granted, the course is not the fastest, it is on the Provo River Trail which tends to be slower than most race courses, and it has a 180 turn, and I am doing it alone, but still struggling to break 5:40 average over 3 miles and failing does not feel good. I am finally past that, I still struggled, but at least it was 5:39 average, not 5:4x. Some positives: I was only 3 seconds slower in the last mile than in the first, and only 6 seconds slower in the second in spite of a 180 turn. There was an odd quarter at the start of the second mile that somehow ended up being 82, and there was a slight uphill quarter at the start of the third mile that ended up being 84. Those surges did not last, and did have a negative effect of slowing me down later, but at the same time I did not realize I was surging, I just put in a little bit of effort to prevent a slowdown. The last quarter was 83, not very good, but what I liked about it is that I smelled the barn with about 100 meters to go and started moving my legs. I was not able to do that in the previous runs. Then I ran home and ran with the kids. Benjamin did 3, Jenny and Julia 2, Joseph 1, and Jacob 0.5. I did 2x400 in the last 1.5 miles - 72.2 rolling and 70.3 down. Benjamin did the last one and ended up with around 70.5 which is his PR. 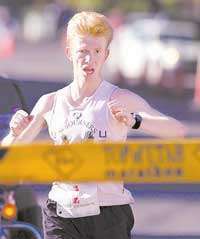 He now boasts being able to run for a quarter at a pace that is a little bit faster than the world record marathon pace. He said to me - "And some people run full marathon like this?" I think it is a good idea for every runner to practice running world record marathon pace for as long as he can, even if it is only 100 meters, so that 4:44 per mile marathon will mean to him more than just words and a superficial wow. A.M. Did 6x400 workout in the middle of my 12 mile run. First 3 with orthotics. The splits were 72.8 up - 68.9 rolling - 68.1 down ( Benjamin stayed with me on this one for a part, then fell back and finished around 73) - 72.1 up - 69.4 rolling - 67.9 down. About 2 seconds per quarter faster than last week. Benjamin did 3, Jenny and Julia 2, Joseph 1, and Jacob 0.5. So there was a definite improvement. Did it come just from training or did the warmup and walking around in orthotics help? Time will tell. Some observations: during the warmup I felt that my right foot was being stretch somewhere deep in the arch. Once I took off the orthotics, the right foot felt on plantar flexion to push the body more forward and upward with a reduced (compared to "normal") lateral component. The last 100 also did not feel as hard as it normally does, and I was getting surprised when I would discovered that the finish was closer than I expected. A.M. 12 miles total. Did 2x400 into a headwind - 70.4 rolling, 69.8 down. Benjamin did 3, Jenny and Julia 2, Joseph 1, and Jacob 0.5. A.M. Long run - 18 miles. Did the 5 mile tempo on the Fast Running Blog course in 28:25, splits 5:39 - 5:40 - 5:41 - 5:46 - 5:39. HR was steady at 162-163 at 5:40 pace, dropped to 159 in the fourth mile, and peaked at 167 in the last mile. Last quarter was 82. Positives: improved the time by 19 seconds since last week, HR at 162 and peaking at 167 shows improved neural drive - the quarters are doing their job, and ability to pick it up in the last mile. Negatives: aerobic fitness still lacking - 5:40 pace HR should be no higher than 158, and HR of 167 should produce 5:10 pace, not 5:30, loss of pace/drop in HR in the fourth mile. Ran with the kids as part of the long run. 3 with Benjamin, did 2x400 72.9 rolling, 70.1 down - Benjamin stayed with me on that one and got a new PR. Jenny and Julia ran 2, Jacob 0.5, and Joseph 1. Day of rest. Went to church. The lesson in Sunday school was on the Atonement. The Sacrament meeting talks were on overcoming addiction. A.M. Total of 12.5. Ran with the the kids - Benjamin 3, Jenny and Julia 2, Joseph 1, and Jacob 0.5. Did 2x400 towards the end - 70.4 rolling, and 68.7 down. A.M. Total of 13.5. Did the 3 mile tempo in 16:52 - splits: 5:32, 5:40, 5:40. Felt strong in the first 1.5, then lost the rhythm after 180 turn. I am wondering if I should do those tempos without a 180 for a while to better diagnose the loss of rhythm problem. Positives: 5:32 felt very easy in the first mile. Negatives: 5:40 felt very hard later on, I felt the form was a whole lot worse. Perhaps I can see the glass as half full. The form felt bad later because it was much better earlier. Did 2x400 while running with Benjamin (he did 3 miles), 70.4 rolling, and 69.1 down. Benjamin did the last one with me and I could not drop him - this is his new PR. Jenny and Julia did 2, Joseph 1, and Jacob 0.5. P.M. Got my lazy bum out for an eventing run for the first time in a long time. Was motivated by the latest HRM observations - HR being 5 bpm too high for the pace in the 5:40 range. Ran 5 miles at about 7:20 pace. A.M. Did 12.5 including the kids runs. Benjamin did 3, Jenny and Julia 2, Joseph 1, and Jacob 0.5. Did 2x400 - 70.4 rolling and 69.5 down. Benjamin did a pickup at the end of his run and we ran the last 400 in 86. A.M. Today I tested my Android project. I have been working on a running tool. The goal is to have a 100% replacement for Garmin + more. Android phones have a GPS, an accelerometer, a magnetic field sensor, and Bluetooth capability. So you can read HRM data from a Bluetooth-capable strap, and the with the combination of GPS and accelerometer get a better estimate of the distance than just the GPS. Additionally, accelerometer allows you to detect form abnormalities. I started with what was the easiest, but at the same time a stepping stone to more complex operations. Detect a simple form abnormality - excessive lateral swing. So you hold the phone in your hand and try to keep it in the plane that is perpendicular to the ground and parallel to the direction of running. If the angle of the phone's acceleration relative to that plane exceeds the chosen lateral swing tolerance level, the phone vibrates. The goal is to be able to run without making it vibrate. So I learned my Android basics, and after some trial and a good amount of error came up with something that I could test on my run. I did 6x600 spread throughout 12.2 mile run. The times were 1:49.1 (rolling) - 1:48.7 (down) - 1:47.8 (rolling) - 1:48.1 (down) - 1:49.1 (rolling) - 1:49.8 (down). The "down" is really not that much down - only a second per quarter faster. I was happy with the performance of my tool for the most part. The core part worked OK - it vibrated like it was supposed to. What I missed is being able to time the splits with the phone as well, which is the next feature. And I need to fix it so it will not let the phone power off half way through the run. Benjamin ran 3 miles, Jenny and Julia 2, Joseph 1, and Jacob 0.5. A.M. Did a medium-long run today of sorts - 15 miles with a couple of pickups. First a mile in 5:51 then another in 5:45, which felt so good that I wanted to just keep going, so I kept going all the way to the house even though it was an odd distances, and ended up with 8;27 for 1.45 or so miles. Tested the phone some more. Benjamin did 3, Jenny and Julia 2, Joseph 1, and Jacob 0.5. Benjamin picked up for a quarter at the end in 87. Jenny and Julia ran 2, Joseph 1, Jacob waited for me to get get back. P.M. 0.5 with Jacob, and 3 with Benjamin.